Bad news for @IsbUnited as their star player @ShaneRWatson33 is out of the #HBLPSL with an abdominal injury. #QuettaGladiators 33/0 after 4 overs. #QuettaGladiators 35/1 after 5 overs. 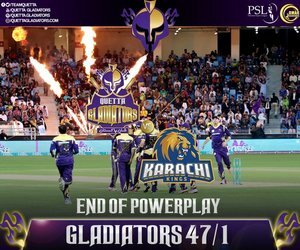 #QuettaGladiators 47/1 after 6 overs. #QuettaGladiators 56/1 after 7 overs. #QuettaGladiators 66/1 after 8 overs. 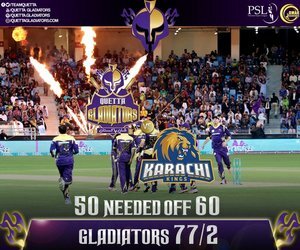 #QuettaGladiators 71/2 after 9 overs. @KarachiKingsARY bring in @ravibopara . He destroyed @lahoreqalandars 's chase at this very point in the game yesterday.